I love glorious cool days filled with outside projects. The air is exhilarating and the exercise invigorating. What can make me cranky on a day like this is to have to stop and cook. Surely you’ve also noticed the appetites that accompany such work projects. Here is one of my answers to the problem — I do not stop to cook. I have a large pot of something ready to warm for lunch. There is enough in the pot to last through afternoon snacks and a simple dinner. Needless to say, this takes a very large pot. I have an assortment of sizes. The largest qualifies as a caldron. If someone gets hungry in the mid-afternoon, they simply get another bowl full of what is in the pot. What is in the pot must be tasty, satisfying and packed with nutrition because that’s all you get! No one has yet to register a complaint. Here is a recipe for filling the pot and filling tummies for the day — double the recipe for a big work day. The ingredients are very filling and the flavors improve with each warming. I present the starring soup from our last yard-work day. This recipe makes 2 1/2 quarts of soup. Cut it in half or even double it to suit your needs. Heat the oil in a large soup pot over medium heat with the bay leaves. Saute the onion in the oil until the onion gets limp. Add the garlic and saute for about 2 minutes, stirring constantly. Add the sausage and break it up for faster cooking. Stir occasionally. If you let the sausage brown a bit, you will get better flavor in the soup. Stir in the tomato sauce and oregano. Bring it back to a simmer. 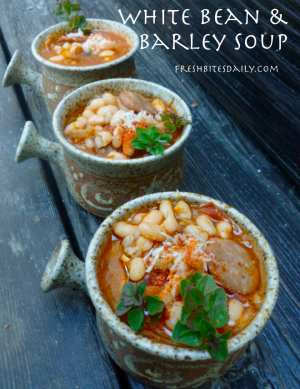 Pour in the white beans and barley. Stir and bring to a simmer. Add the bone broth until the soup is the thickness you like. We tend to eat this more as a stew than a soup. So, I use less broth. Do what works for you. Bring the soup to a simmer. Check for salt and pepper and make any necessary adjustments. 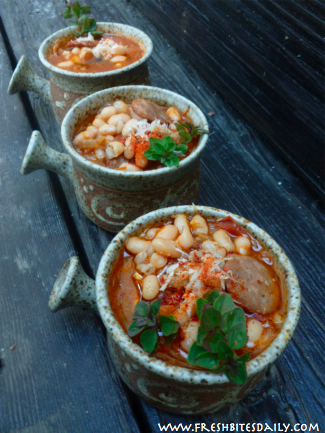 Serve up in heated bowls and garnish with grated Romano or Parmesan cheese. You might let each person apply their own cheese. Some folks like more. Some like less. If you have access to fresh oregano, do use it as a garnish. The flavor it brings to a bowl of hot soup is amazing.